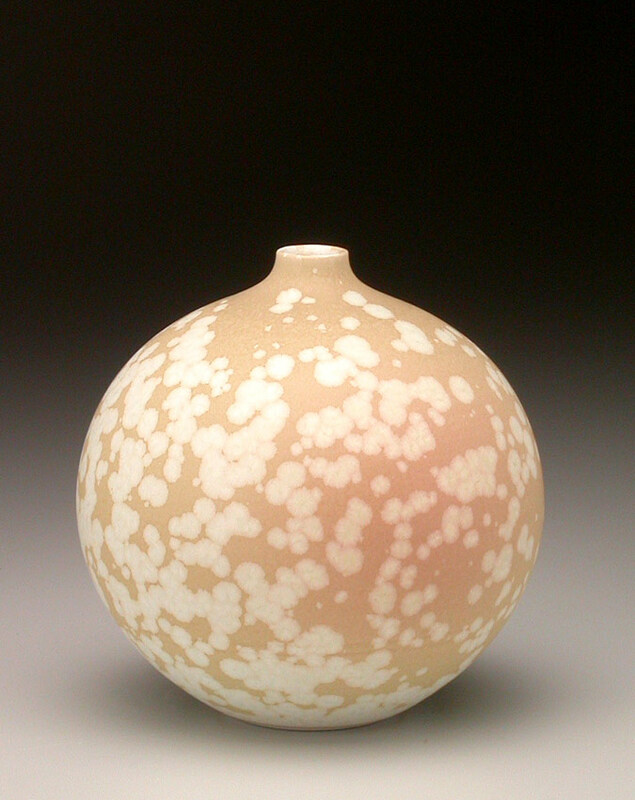 My husband John Tilton makes porcelain art pottery: bowls, vases and covered jars with cone 10 reduction glazes. 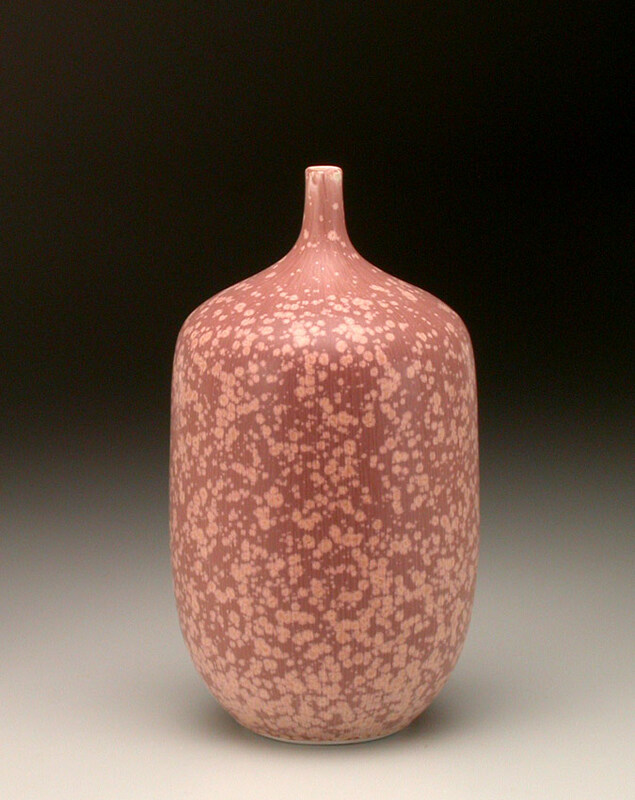 The forms are intensely simple and restrained, and the glazes are quiet and deep. It’s pottery far removed from the mainstream of ceramics, as our lives are also removed: we live and work in a meditation community. This setting has the effect of being in both a shelter and a storm. Surrounded by people of similar priorities, our community is a refuge in the quest for inner growth. Yet the growth process can be likened to standing defenseless but calm in the face of a hurricane, with winds hurling debris in every direction, as we strive to eliminate untruths from our lives. The same striving for the genuine is applied to John’s pottery, which provides our livelihood. The struggle for reconciling what we want in our lives and pots with what is, seems to be doubled in strength as the pots mirror whatever is happening internally. John has been potting for 30 years, and I have been helping him for 16. For us, making pottery feeds the spirit, and spirit feeds the work. We have found the greatest asset in both our spiritual life and pottery making to be self-discipline. Meditation requires mental discipline in itself, and in our community, all residents attend meditation services twice a day for about four hours daily. Committing to forego all other activity between these hours daily requires great discipline. Yet once the commitment is kept for a period of time, it becomes all-pervasive: we find ourselves more disciplined in all endeavors. When everything does work, though, it feels as if we’ve been given a precious gift by the kiln. John has said the pots are about the macrocosm and microcosm,’ and that really describes them for us. Looking at some of the pots, you can almost see the universe moving. It’s this perception that has fascinated us for so many years. We both loved seeing the deep space Hubble photographs, and also loved touring the genetic engineering lab of a friend, looking through microscopes at infinitesimal microorganisms which looked remarkably like the matt crystalline glazes we’ve developed. The ideas that the pots express seem uniquely suited to finding their voice in this kind of clay work. In cone 10 reduction firing, there’s an interaction of the porcelain clay and glaze that’s impossible to achieve any other way. The character of the clay comes through the glaze. 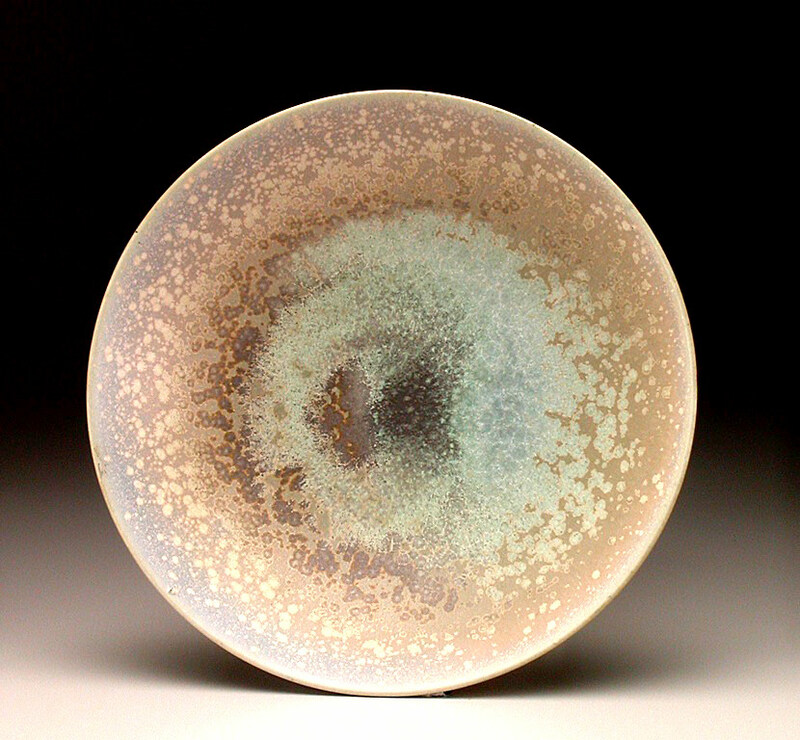 There’s a fusion of the porcelain with the glass of the glaze, and the glaze itself forms multiple layers as it melts. The clay/glaze interface is crucial. Sometimes after a good firing there will be pieces that seem to glow from the inside. One of John’s goals is to make pots that look as if they weren’t made by someone–to seem as if they were born intact, or just somehow evolved through natural process. So we’re interested in working with the natural evolution of the forms and the glazes, really looking at the firings to see where the kiln and the pots seem to be leading. We’re always asking how the work can grow from within, in an organic way that still remains true to its origin. With this in mind, the pots are glazed in layers, echoing the layering process of individual glazes that naturally occurs during firing. Multiple firings simulate the stresses of the earth that minerals undergo in the process of becoming crystalline. Similarly, John’s forms, while not strictly traditional, have their roots in the classical vessel. Living simply allows us to wholeheartedly commit ourselves to what we’re doing without reservation. With respect to our work, this means that whatever the pots require, they receive, no matter how unreasonable it seems. John has had pots finally work after twelve firings, to be offered for sale for the first time more than two years after their first firing. To fire a pot twelve times, grinding off glaze and spraying more glaze on before every firing it undergoes for two years, is clearly unreasonable. Nevertheless, we’ve done it many times. Why? Because we’re interested in the next frontier. We really want to see how far the pots can go, and what they have to show us next. This is the place our direction comes from, rather than looking at new trends in the marketplace in ceramics and figuring out how to incorporate them into the pots. There are many potters whose work we respect, admire and feel we can learn from, but we’re not trying to adopt their techniques or change ours. For us, all the information needed for taking the next step seems to exist in the present one. Originally presented in Clay Times, Mar / Apr 1997 issue, pp. 40-41. Articles published on the Tilton Pottery web site are done so with persmission from the author and/or publisher. Images are different from those in the original article, but are from the same time period.